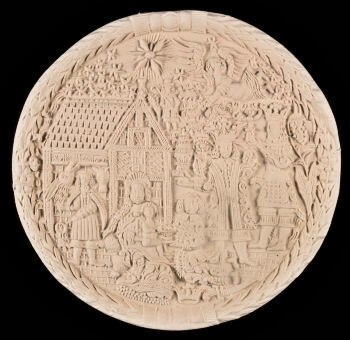 Springerle molds are not only being used to produce wonderful one of a	kind cookies but are also being used to create absolutely beautiful art. If you are looking to produce something - a unique gift that will make an outstanding impression on the recipient and anyone who sees it - Springerle will do it. You can even use food safe color to paint the Springerle. Just select a few from what I offer - see the section "Heirloom Cookies"! Over the past few years we have been gathering all that we can on Springerle molds and their uses. Modeling clay, salt dough, paper casting, applesauce cinnamon dough, paper clay and beeswax are just some of the mediums that are being used with Springerle molds. In my Crafting section I am providing directions, information and where necessary, recipes for different craft ideas using Springerle molds. There is also a recipe for homemade Playdough that was sent in to me. You can use this to see what sort of image your Springerle mold will produce.